Today's post in the March is for Making series (30 blog post in 30 days to inspire educators to create, make, and learn) will provide you with resources and inspiration around making movies. As tools to make movies have become more and more accessible, the opportunity to make more videos is within any student’s reach. 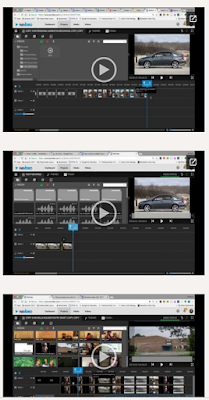 Whether it be a movie app on their phone, movie making software on their computer, or cloud based tools like WeVideo that can be accessed on a Chromebook, movie-making tools are all around us. But just because any student can make a movie, does not mean they can make a movie that yields powerful learning or that becomes a piece of quality work that leads to a culture of excellence in their school. 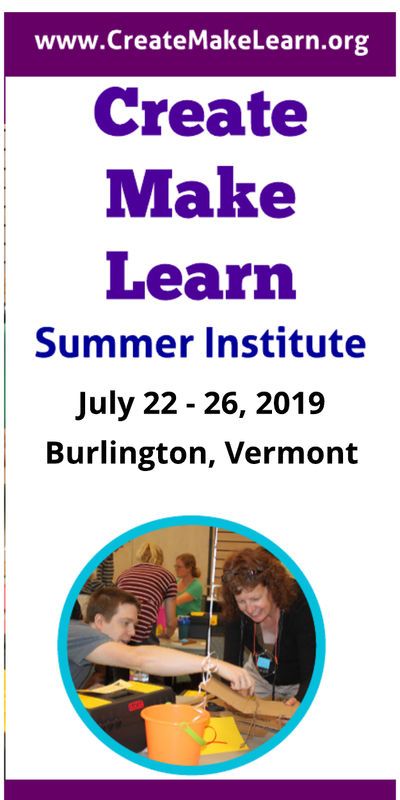 Last summer, at Create Make Learn Summer Institute, Michelle Holder’s goal was to immerse herself in a making journey that would allow her to create a culture of excellence in her school to help her students create movie projects they could be proud of. Having been a long time fan of Ron Berger’s Beautiful Work as sound pedagogy, I was excited to watch Michelle document her Create Make Learn project journey to help students produce more polished and engaging videos. “Is there a more profound lesson than taking pride in creating work of importance and beauty for a real audience?” Ron Berger. Beautiful Work. Michelle used the stages of design thinking to guide her journey. She started with some powerful questions about the maker movement itself. ...create a way to help students produce more polished, engaging videos to document their creativity and learning? By taking on the role of a student in creating a personal narrative video, Michelle’s empathy for her students and what they would need to be successful increased. Her fluency with WeVideo increased; she learned to use a green screen, lighting, and microphones to increase the quality of her video; she learned advanced tips and tricks from framing to camera angles that she couldn’t wait to pass on to her students. By the end of the week, Michelle had created a piece of high quality video that she was proud of - her own personal narrative. She decided that creating some high quality tutorials for her students to use on the techniques that she found most effective in her movie making journey would be the next step on her journey. It would also give her a chance to keep practicing her movie making skills. Michelle’s prototyping process lead her to learning how to use the New Google Site, where she organized some newly created tutorial videos along with other resources that could help her students create high quality videos. The site is filled with great tips and handouts like where to find copy friendly images and audio for their videos and how to properly cite the resources they used. Michelle received positive feedbacks from her colleagues and started the year ready to test her prototype with her students. Throughout the year, students at Randolph Union High School have been using their Chromebooks, WeVideo accounts, green screens, microphones, and the resources that Michelle has provided to create videos that demonstrate their creativity and their learning in different content areas. VitaLearn 2017 (2) from Michelle Holder on Vimeo. This is a weather report video the students had fun creating. They used green screen, music and creativity to write and produce a weather report in Spanish complete with commercials. ED & WG Weather Report from Michelle Holder on Vimeo. This is a PSA / commercial for Randolph Union athletics. It was meant to be short and grab attention. RAND Commercial- Hunter Brassard (1) from Michelle Holder on Vimeo. Making movies has provided a vehicle for growing all 5 of Vermont’s transferrable skills and to gain proficiencies in both Language arts and Visual arts as well as increasing their knowledge of specific content. 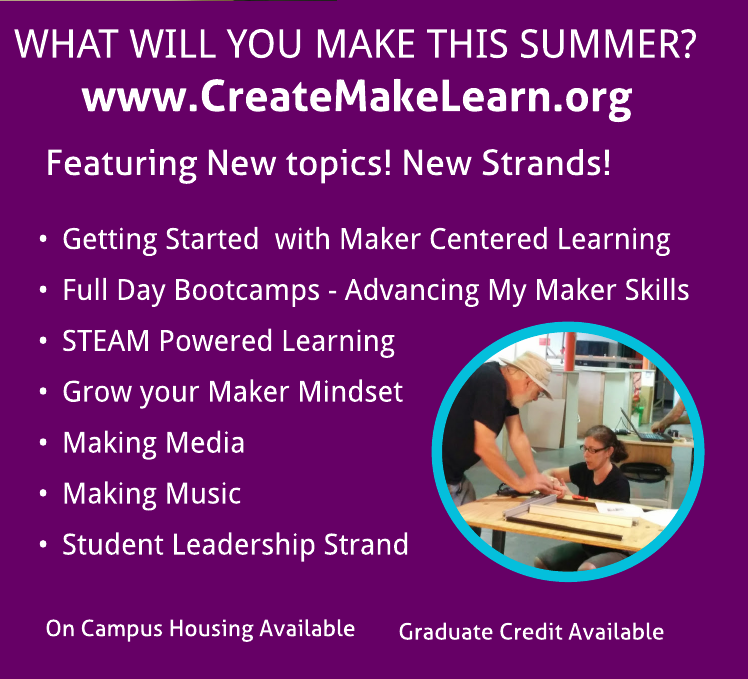 Michelle felt that Create Make Learn Summer Institute experience left her feeling empowered to create and that there were no limits on creativity and she is now totally invested on helping her students feel the same through creating, making, and learning.